Brand marketers continue to struggle with determining return on investment for social media campaigns. Eighty-eight percent admit to gaining positive ROI on campaigns, but a study released Wednesday from Wildfire, a social media platform company, shows that the metrics remain all over the map. While inconsistencies make it difficult to create and follow industry standards, Wildfire CEO Victoria Ransom said 75% of survey participants said they still plan to increase their social media budgets this year. Gaining positive ROI is great, but what do marketers measure? Thirty-eight percent monitor increased fans, likes, comments and interactions, which means the marketers put a value on the fan; 24% point to an increase in revenue as a metric; and 15% look toward increased brand awareness. Less than 5% of all respondents defined positive ROI as revenue less cost -- a more traditional metric. When asked the top three reasons for valuing a Facebook Fan when applying traditional definitions of ROI, forty-four percent said they use that metric as a way to get new consumers, 18% sought higher conversion rates, and another 18% said more frequent purchases. Survey respondents were explicit about how they judged effectiveness: fan or follower growth, fan engagement, ad cost reduction, increased sales, and increased leads. Ransom views social media marketing as a process composed of three steps. First, marketers must look at broadening the fan base. When it comes to building a network in Twitter for brand pages, companies need to acquire followers. 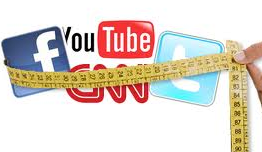 Ninety-seven percent of those surveyed believe social media benefits their business.